Following the trail of Gromit Unleased! This is the second installment to my post on the “ambitious” weekend goal of covering Yeovil, Cheddar-Gorge, Street, Bath and Bristol. The first part can be read here. My friend had extended invitations after invitation to visit Bristol but our plans simply didn’t mesh as he always works out of town just as much as I do if not more. This time being in Somerset it just didn’t make any sense for me to be this close to Bristol and not visit. The journey to Bristol started from Bath and took only 30 minutes drive. Driving through picturesque countrysides via long winding country roads, I was looking around the city limits as we entered Bristol, trying to see if I could catch a glimpse of triumphant Victorian engineering at its best but I just couldn’t see it. Meeting my friend Khalid near his home we set off to walk to the Clifton Suspension Bridge via the scenic route through Ashton Court Estate. Khalid took us to see Ashton Court Estate having walked under the fly over bridge and coming across skateboarders. My bf decided he was going to show Khalid and I some of his skills on the board. I was stunned that dude still had some moves on him from his teenage years. Arriving on the Ashton Court Estate, all 850 acres of it, beautiful garden with huge oak trees which were apparently imported and a grand deer park that has kept deer here since 1332, the estate also boasts not one but two 18-hole pitch-and putt golf courses(I dont do golf, I am guessing thats pretty big right?). The estate was owned by the Smyth family and has a rich history with stories of impersonations and fights over inheritance worthy of a blockbuster write up. We circled the estate to walk through the park to see the deers up close. I was really looking forward to seeing these beautiful red deers that roam freely on the grounds but unluckily we came on the day they had recently introduced a few young deers into the compound so they closed off parts of the grounds to allow them to settle in. We could see them from a distance but not near enough for my phone to take good shots. Just like us, they were sheltering under bushes to hide from the fierce sun we had on Sunday. A real shame that I had managed to leave my DSLR in my living room when I left on Friday so I could not zoom in on them to take good pictures as they were far away. Really beautful animals. I may have to check out the ones close to home, Richmond Park in London also has some Red and Fallow deer which have been roaming around and grazing the park since 1532. Ashton Court Estate also hosts the Bristol International Balloon Fiesta which has been running for over 30 years. During the Fiesta hot air balloons take to the sky as the sun rises and sets with mass ascents from 150 teams taking off at 6am and 6pm to light up the sky with these colourful, fun and creatively decorated balloons. This year’s Fiesta takes place from 8th-11 August. I may hopefully come back to see these and the deers! With the gates of Ashton Court Estate leading to Clifton Bridge closed, we walked back down and crossed the river passing the lock that controls river flow in Bristol’s rivers. As we walked up, we could see Clifton from miles away. We must have walked around for at least 2-3 miles to get to Ashton Court I didn’t really want to ask just how we were going to get up to the height where Clifton stood. We took to the walk up the winding path snaking around up to 75 meters above sea level before arriving in sweaty excitement at the reward before us. Coming face to face with the Clifton Suspension Bridge having looked at many pictures and reading about its construction and designed by Isambard Kingdom Brunel, seeing it there was pretty awesome. Having won a contest in which he put forward a few drawings in a competition, it was a real shame he died five years before its completion. He battled funding of the project, the construction was completed a good 30 years after the starting due to delays caused by funding as well as riots and protests in the city with some opposing plans over expenditure for the project. For me this is another iconic structure showcasing the true beauty behind metallurgy and how advanced we are in technology of metals(among other things). I see San Francisco’s Golden Gates bridge in the same light. Its sounds ridiculous that I would travel that far just to marvel at a bridge, the Golden Gates is not just a bridge now is it? Its amazing just how creative the human(yes, other animals too!) mind can be and just how something that was built then with the little technology they had compared to what we have to day can stand the test of time. The Golden Gates Bridge was started around the same time as Clifton but completed in 1937 while Clifton opened in 1964. Spanning 214 metres between two towers and 75 meters sea level, it was originally built for pedestrian and horse drawn traffic but now carries 12,000 plus cars a day and around 4 million a year. Like John Miur said, “The power of imagination makes us infinite”. The Clifton Suspension bridge is truly ingenious and innovative construction by the Victorians. It’s now Bristol’s cultural icon structure and easily recognisable image of the city. You cannot visit Bristol, the home of the famous street artist, Banksy, and not run into his art on the streets. Having passed some of the street amateur art under the bridges I wanted to see the real deal. Bristol is quite hilly so prepare for a little up an down. I had not planned on hiking and didn’t pack any hiking boots but my Anne Klein iFlexi flats haven’t failed me yet. What goes up must surly come down. As we walked up to Clifton we had to walked back down to the town center. With the bus taking 20 minutes to arrive looking at the timetable, our tour guide for the day, my friend decide it was going to take just as long to get into town so walking was to be the way to get back down. At this rate I was thinking I could do with a but of a break after walking around in the heat and we passed a few Boston Tea Party cafes which seemed just as popular as Starbucks or Costa in London as I had spotted a few in Bath too. Not long before getting into the center did we come into contact with a ” A Banksy”, above. I would have loved to hunt for more but it was getting dark and my feet were starting to ask why I was torturing myself after a lovely spa in Bath. I had my first encounter with Gromit unleashed was when I saw it in Cheddar Gorge and my bf took to taking pictures of me while I posed and made faces at Gromit. Over the years we have had several themes of this nature around the UK, we have had bears, cows, elephants and other animal statues painted and scattered around different cities in the UK and auctioned off to raise money for charity. They have unleashed 80 Gromits for 10 weeks around the Bristol county area all painted to different themes. Gromit unleashed is a public art exhibition with giant sculptures of Gromit, decorated by invited artists and unleashed on the streets. This is being led by the Wallace and Gromit Grand Appeal, a charity raising money for Bristol Children’s Hospital. The exhibition is such a great way to explore the city, especially if you are bringing kids along(I was just as excited each time I saw one). There is also a trail with a map marking all the Gromits and where in the city you can find them. There is also an app you can download with a guide to Gromit spotting(I didnt get that far). These will be on show until 1st of September so try and see them if you can. The Gromits will all be on auction at the end of the exhibition to raise funds for the appeal. I came across Superman Gromit, Pharoh Gromit, Pirate Gromit,….but sadly not enough time to see them all. 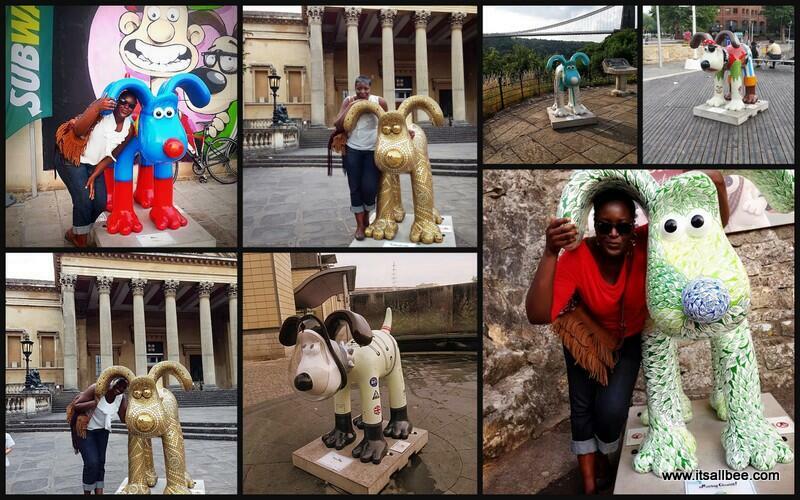 Just as I was finishing this post I found out that there will be one Gromit in London. I will hunt it down and when I find it I will post it on my Facebook. Bristol has some of the longest cycling routes stretching for miles with real beautiful scenery so next time I may rent a bike . It is such a large city that one day was never going to be enough but I came and saw what I was really was hoping to see, Clifton(and my friend). I still yearn to see more but night approached and Monday was slowly baconing, it was time to catch up over dinner before we left Khalid and bf and I went our separate ways as he was staying in Somerset while I am working in London. For more street art check out my previous post on Street Art in London and for more on Banksy’s Street art, check out Barbara’s piece on the Banksy Effect in Bristol. Details of Gromit and map of the trail can be found here. For Banksy Street Art tours in Bristol check here for details. My long weekend of hiking, spas, hunting for art came to an end just before midnight on Sunday. So do plan on “gromiting”(the art of hunting for gromits) or seeing the Balloon Fiesta in Bristol? What wonderful pictures – feels like I am there with you! Thank you so much for linking up to Travel Tuesday – it was great to have you! Love this piece! Thanks so much for flagging it up to us. Can't believe we missed Ashton Court, but there was just so much to do in that part of the world. The Gromits were fantastic weren't they – the kids absolutely loved them, and we did too. We have masses of pics as well! I was also amazed in the recent weather when they had to shut the Clifton Suspension Bridge for the first time ever. That seemed very shocking. Thanks for visiting us!